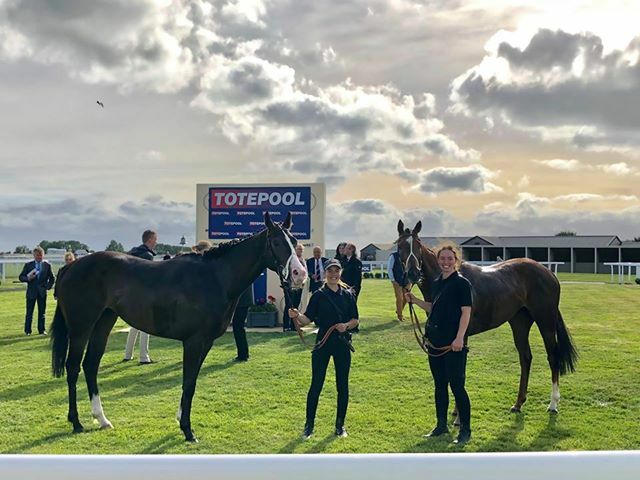 It was an extremely busy Saturday for the yard with six runners at four different meetings and it proved to be an extremely profitable day with a DOUBLE at Bath, including a 1-2 and all our other representatives running solid races to pick up prize money. It was a show of immense speed from MAWDE as she blitzed the opposition to make all the running on her third start under seven pound claimer Theodore Ladd at Bath. The performance was even more remarkable as the five horses that raced with her in the first half of the race ended up filling the last five places and crossed the line at least eight lengths adrift of Mawde. She recorded a decent time in the process and it looks like she could be a decent sprinter. She should continue to improve with experience and the £250,000 Weatherby’s Super Sprint, a race we won with Lord Kintyre back in 1997, will be her main aim as she has a lovely light weight of just 8st2lb and will give her owners plenty of fun. It is never ideal to have two horses in the same race but quick ground at Bath were optimum conditions for both SPOT LITE and RIO SANTOS (pictured in the winners enclosure – thanks to Steve Black) and they duly finished first and second. Spot Lite has been extremely progressive this season and was recording his third win in four starts, his third a minor blip on Sunday as he did not appreciate being crowded and didn’t see daylight in time. The extra half a furlong clearly suited and he should have no problem staying a sixth furlong as he steps up in grade. It was another solid effort from Rio Santos, his third placing in his last four starts and although it is not easy to find races for a horse rated 45, he is certainly due a win. It was another solid effort from HAWRIDGE FLYER, going down by less than a length in third place at Sandown. A combination of a 3lb rise for his Goodwood second and his stamina running out up the hill probably cost him victory but at least we know he handles faster ground. Hopefully the handicapper leaves him alone but he is certainly due a win. SUFFICIENT improved on her second outing to finish third at Leicester but was a bit too keen in the early stages. It wasn’t ideal getting badly crowded on her debut at Windsor and she has had a much easier run through last night so hopefully she will improve mentally for the run and be a bit more relaxed next time out. DUKE OF BRONTE made the trek up to Yorkshire for a very competitive renewal of the Listed Sky Bet Grand Cup and we were hopeful that the step up to 1m6f might see him improve again from that excellent third at Goodwood. Of the eight runners he was seventh highest rated and had around ten pounds to find against some very useful Group performers in Marmelo and Weekender. That pair duly finished first and second in a race that produced a course record (very impressive considering the Group 2 Yorkshire Cup is run over the same course and distance and it was 0.23 seconds quicker than what Stradivarius achieved in this year’s renewal) and the top five all ran to form so it was a very creditable effort from the Duke to finish sixth, beaten just five lengths. He ran right up to his best and it was interesting that once again he was beaten two lengths by Time To Study, just as he had in two previous races at Newbury last year. This run suggests he has a cracking chance in the Ebor, where he would be getting weight from those that finished in front and we know big field handicaps suit his style of racing and there will be much weaker pattern races to compete in this season.